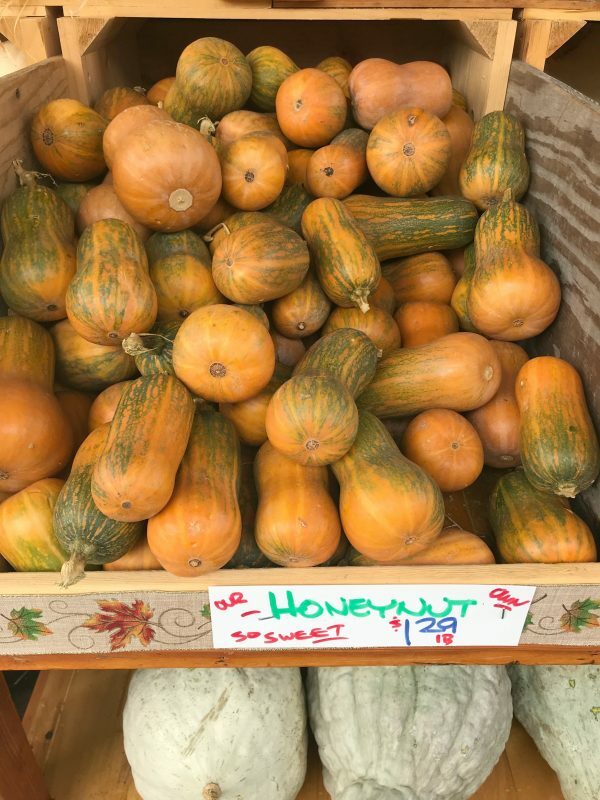 Have you seen Honeynut squash at the market this year? It’s a newcomer to the winter squash aisle. It’s been around for less than a decade, and you’l know it when you see it; Honeynut looks like a miniature version of butternut squash. When roasted, the flavor becomes intensely sweet and the color a bright golden orange. 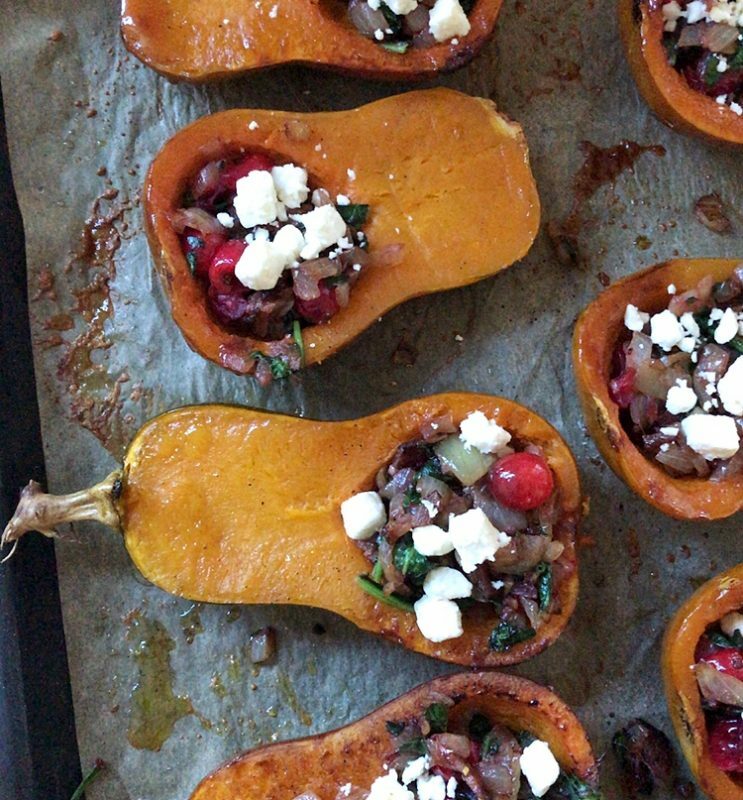 These squash are downright cute, and they’re perfect for roasting and stuffing. 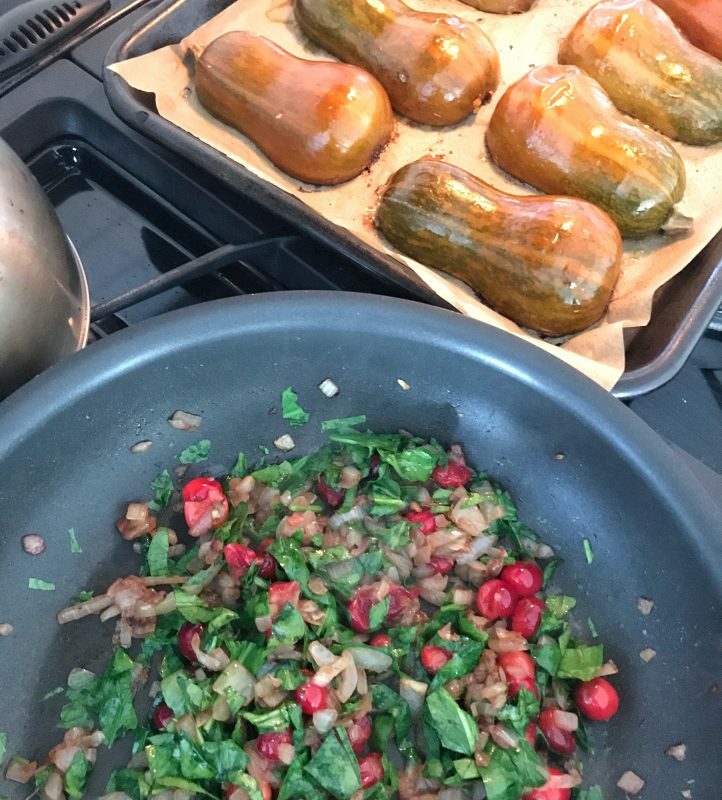 Honeynut squash is a lovely little gem of a vegetable, and for this recipe, I roast it first and then stuff with a sweet and savory mixture of caramelized onion, garlic, spinach, cranberries, brown sugar, and bacon. I adapted the recipe from my friends at Wilson Farm in Lexington, MA. Wilson Farm carries a variety of squash. Honeynut is one of many including butternut, delicata, acorn, spaghetti, sugar pumpkins, buttercup, and dumpling. 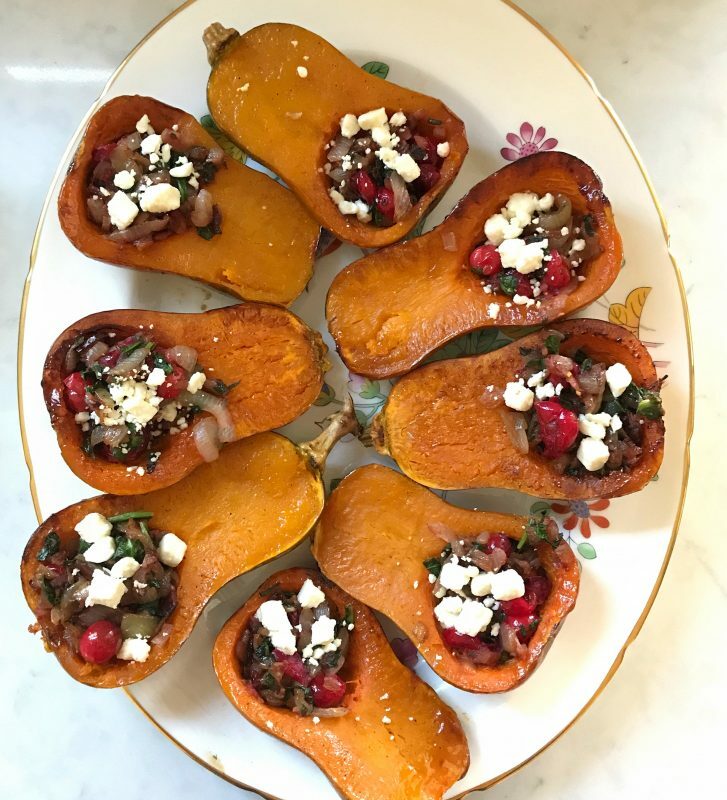 Hear all about this recipe and my interview with Chef Raymond Ost from Wilson Farm on this week’s Winter Squash-themed podcast. 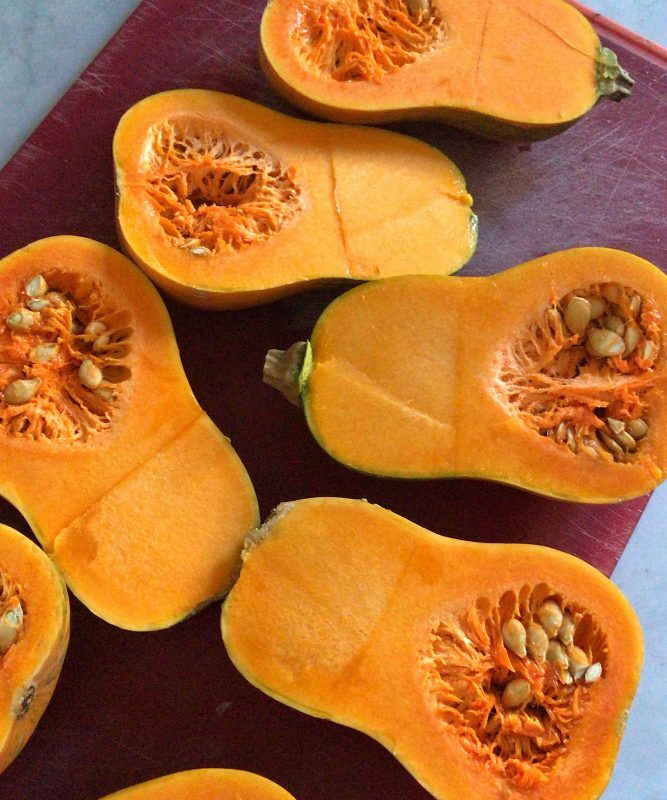 Here’s how you roast honeynut squash: Slice in half and scoop out the seeds. Brush the cut side of the squash halves with olive oil and sprinkle with kosher salt, pepper, and brown sugar. Turn over so the cut sides are down, and bake at 425°F until soft, about 25 minutes. Yummy mixture. Sweet, salty, and savory. I love this recipe as a holiday side dish. You could certainly serve it as a main dish, but if you do, make sure everyone gets two halves. Preheat the oven to 425°F and adjust a rack to the center. Cover a large rimmed baking sheet with parchment paper and set aside. Wash and dry the squash, and then cut in half, lengthwise. Remove the seeds and any stringy membranes with a spoon, and place the squash, cut side up, on the parchment. Use a pastry brush to brush 1 teaspoon of the olive oil evenly over the squash. Sprinkle lightly with kosher salt and pepper and 1 teaspoon of the brown sugar. Turn the squash halves over, cut side down. 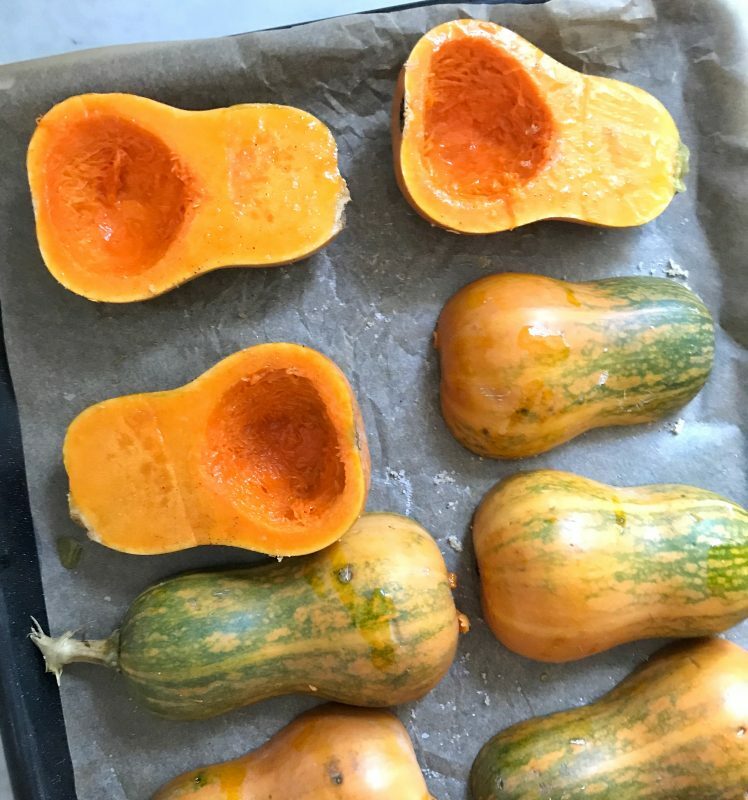 Roast until the thickest portion of the squash is very tender, about 25 minutes. (A fork should slide in and out very easily.) Remove from the oven, set aside, and turn the heat down to 375°F. 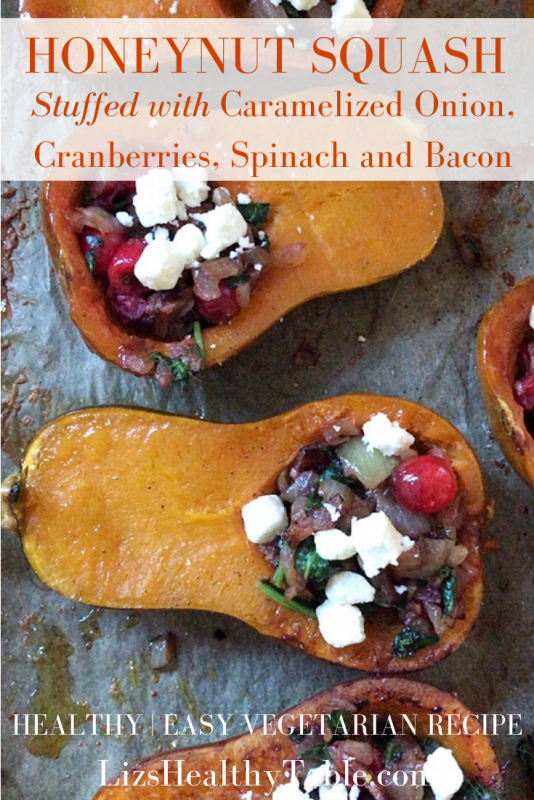 While the squash is roasting, place the bacon in a large nonstick skillet over medium heat. Cook until golden and crispy, a few minutes per side. Set the cooked bacon aside on a double layer of paper towels to drain excess fat. Carefully wipe the skillet clean with paper towels. Heat the remaining oil in the skillet over medium heat. Add the onions and garlic and cook, stirring frequently, until the onions are soft and golden, about 15 minutes. Add the spinach and cook until wilted, about 2 minutes. Crumble the bacon into tiny pieces and add to the skillet. Stir and season with salt and pepper to taste and add the remaining 2 teaspoons of brown sugar. Turn the squash halves over so the cut sides are facing up. Place the mixture evenly into each of the squash half cavities. Top evenly with the feta cheese. Place back into the oven and heat until warmed through, about 5 minutes. Honeynut squash may look like a mini version of butternut, but it's higher in beta-carotene, a precursor to vitamin A. Let me know if you try Honeynut squash and what you think of it. This reminds me of a recipe we used to make back home with aubergines stuffed with caramelised onions. Your version is fantastic and thoroughly enjoyed it yesterday evening. Used pancetta instead of bacon. So glad you enjoyed the recipe. Did you find Honeynut or did you use another type of winter squash?